Musician helps children who are having a difficult time coping with being in the hospital. What do you do? I help children who are having a difficult time coping with being in the hospital by making music with them and helping them use music for relaxation and comfort. I also collaborate with other teams, like rehabilitation and pain medicine, partnering with other therapists to help focus their patient’s attention during therapy, or get them moving again after an illness or injury. How did you get started in the field? I started playing guitar as an emotional outlet when I was a young teenager and always felt like there was some other use for music besides performance. I discovered music therapy after a three-year tour in the Army and finished up my bachelor’s degree studying music therapy on the GI Bill at Willamette University. Should folks have interest in pursuing the field in this area, there’s also an academic program of study in music therapy at Seattle Pacific University. What’s a typical day like? I start by reviewing the census to see if any of my known “music-identified” kiddos have come in overnight or since the last time I was at the hospital. I often do some session planning, coordination and correspondence, then head out for either scheduled sessions, groups or new referrals. Usually after lunch and the afternoon sessions, I enter chart notes or work on special projects before leaving for the day. What’s the best part of the job? Being in the music with sick or injured kids and helping them find ways to use music to feel better, get better or get a different perspective when things are tough. 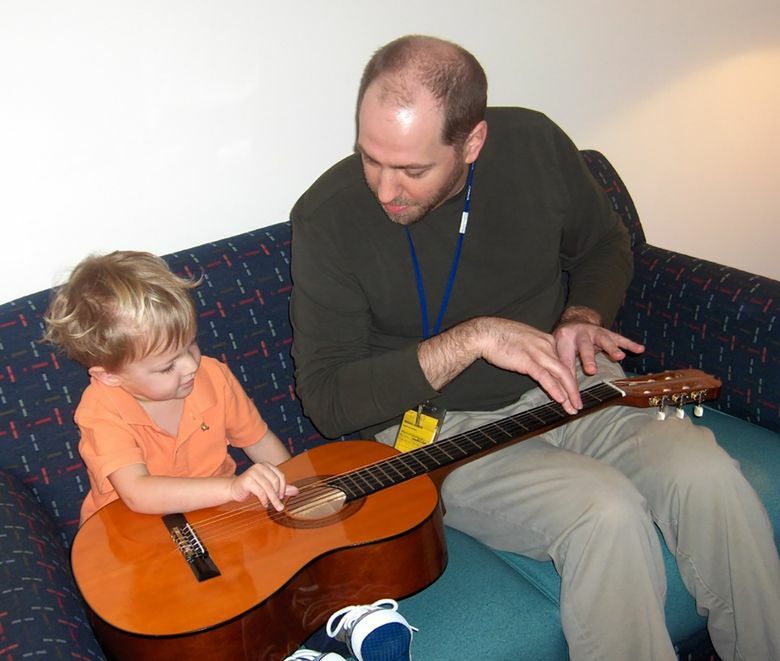 The flip side is that the field of music therapy is still growing, so there aren’t many positions available — I was the only music therapist at Seattle Children’s for over 10 years! What surprises people about what you do? The typical surprise is that I went to school to do this and have a credential (MT-BC: Music Therapist-Board Certified from the Certification Board for Music Therapists) and advanced training (Neurologic Music Therapy at The Academy of Neurologic Music Therapy). The other surprise is that music can be functional: Our interventions are goal-based and developed from research. Most people get how music can make them feel relaxed, or shift their mood, but when they hear a story about a kiddo memorizing a phone number in a single session, or working on improving movement in an arm that doesn’t work as well as the other, that can be surprising. Do you have a cool job or know someone in the Seattle area who does? Email us with your recommendations for people to feature in Cool Jobs.